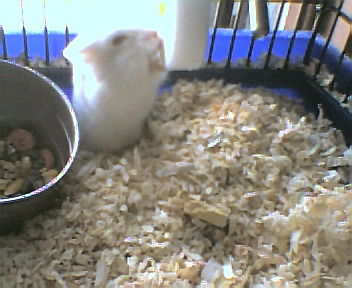 This is Stitch, he's my first male Drawf Hamster. He really doesn't do much but eat sleep and poo. I had to seperate him from the bab, because he started to eat them. The new babies. There so cutie. Right now there running around and driving the mom nuts. I didn't even know she had them till about 2 days later, when I heard one calling for her. 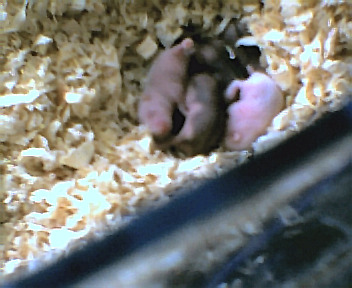 There where 5 but now only 4 do to the male eating one. I hope there be more down the road. 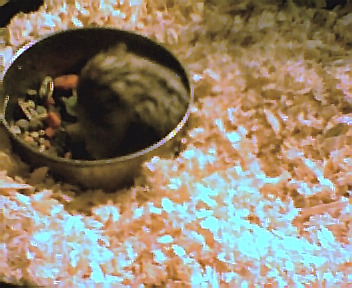 This is Lilo, my female Drawf Hamster. She's a cutie, and seems not to like to site still. She's not even scared of the cat at all. I thought it's cool. But hey, she's one of the kind. Mickey, is one of a kind cat. He seems to think he's a dog. More then any cat I know, he plays fetch, sits, and will walk on a leash. Very clean cat too. Shadow, is my pareket. He's always yelling and talking all the time. Never seem to be quit. 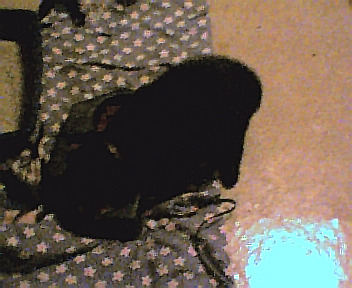 Shadow likes to dance music and sing along with it. I don't have a for him yet. But I will soon.